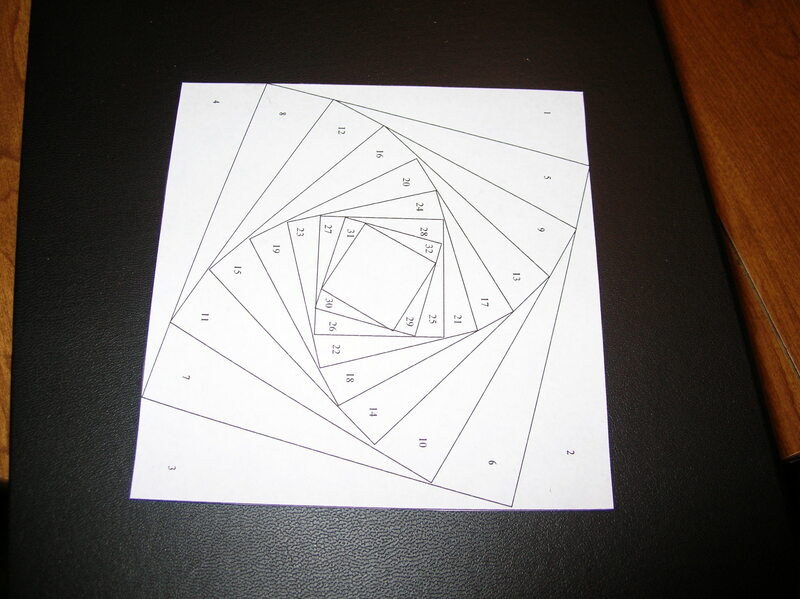 The basic process starts from a template. There are a huge range of templates out there from the very basic geometric bases to complicated patterns that are unique and designed for one specific shape. Since this was my first time, I stuck with the basic square pattern. It was lots of fun to think through how the color would turn out. Also, since it’s put together with the front down, you don’t get to see the final results until it’s all done. There are so many possibilities with this: changing the colors to be coordinating or contrasting or random and crazy. In my Googling of this, I saw lots of creative things done with iris folding and each idea was unique. So much color potential! N’s mom’s birthday was a week or so ago. We’d been planning on getting together with her when she was in town recently, but schedules didn’t work out. So, instead, I’m making her a nice card to mail to her. Fun! I realized that the only birthday option we really had was the “Birthday Blessings” text that is on the George and Basic Shapes. Not a bad thing, but sort of a limiting thing. It will keep working for now (as I’ve only made two cards with it 🙂 ), but I think I’ll be wanting to expand my birthday card options soon. 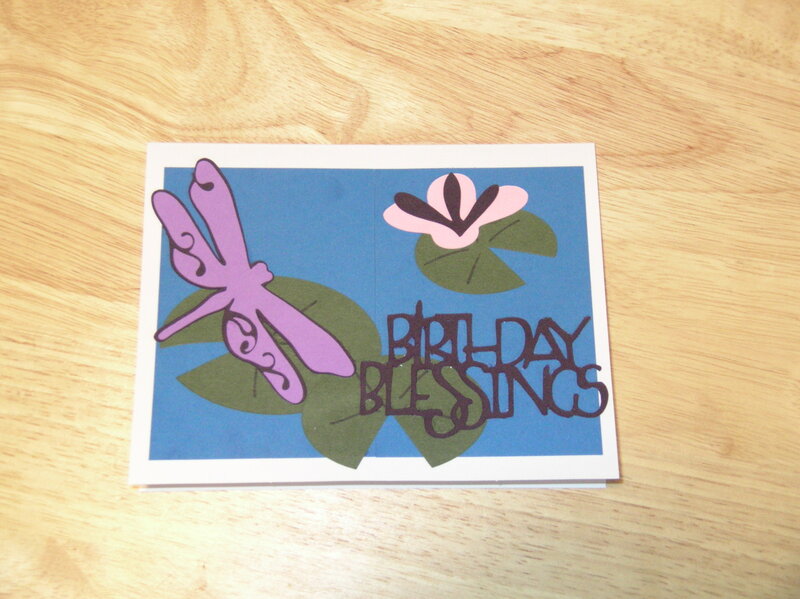 I used both the George and Basic Shapes and the Home Decor catridges for this card. For the lily pads, I did three different sizes of a basic oval and free-handed the notch and lines. I think it turned out fairly effectively. The knitting group I’m a part of at work decided to have a field trip on Friday and go to The Studio, a yarn shop just off the Plaza. There’s been several additions to the knitting group, including me, who hadn’t been before. So, our fearless leader took us there on our lunch. What a fun place! There was a wide variety of types and colors of yarn as well as patterns around to see examples. It sure got me excited to knit something up fun and colorful! I didn’t have a project that I was looking for specific yarn for, so I didn’t know for sure if I was going to buy anything (ha! like I could go to a yarn store and walk out without anything!). However, one skein of yarn jumped out to me, so I decided to buy it and find a pattern later. The brand is Noro and it’s a wool, cotton, silk, and nylon blend. 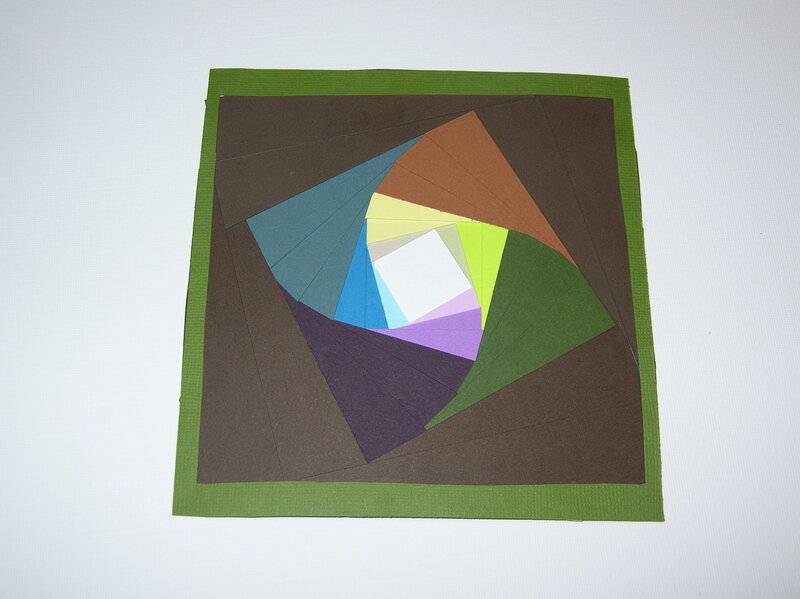 The color is variegated and I think it manages to go through most of the color wheel. 🙂 I’m not sure what I’m going to do with it yet, but I thinking it might need to become some sort of bag. Maybe a bag with some beads or some fun embellishment like that. I’m going to be impatient to start a project with this yarn; hope I find a pattern soon! This is a good view of the variety of colors. Aren’t they pretty? I’m in the process of knitting a headwarmer. Some of you may be thinking, “Um, isn’t that called a hat? ?” Well, sometimes. 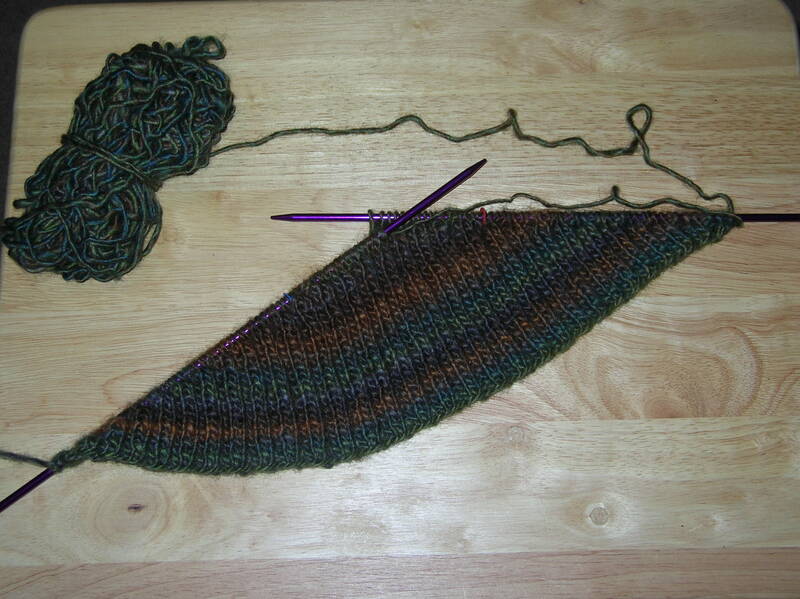 In this case, it’s a pattern called Calorimetry, found in Knitty Winter 2006. It’s basically a wide headband, inspired, as the author says to be able to, “wear your hair up while keeping your ears warm and preventing heat from escaping from the top of your head.” See? Not a hat, but a headwarmer. Anyway, enough of that. For those of you that are having trouble seeing this as anything that goes on your head, imaging that the widest part will be on the top of your head and the narrower ends wrap behind your head. See it now? No? Oh well. *sigh* You’re not the only one. I will prove the head worthy-ness of this eventually, just you wait. The project is a small bag zippered bag. I found the pattern on Craftster, here. (Craftster, by the way, is a wonderfully addicting site full of people that like to make up their own fun projects. It’s definitely on my list of happy internet places 🙂 ) I used some scrap fabric for both the outside and the inside; the only thing I had to buy was the zipper. I love cheap sewing projects even better! The other fun sewing that I worked on this weekend involved yo-yos. Not the kind that go up and down, but the fabric kind. I’ve got some Quick Yo-Yo Makers, and, after a bit of learning, I was able to make a few hold together. 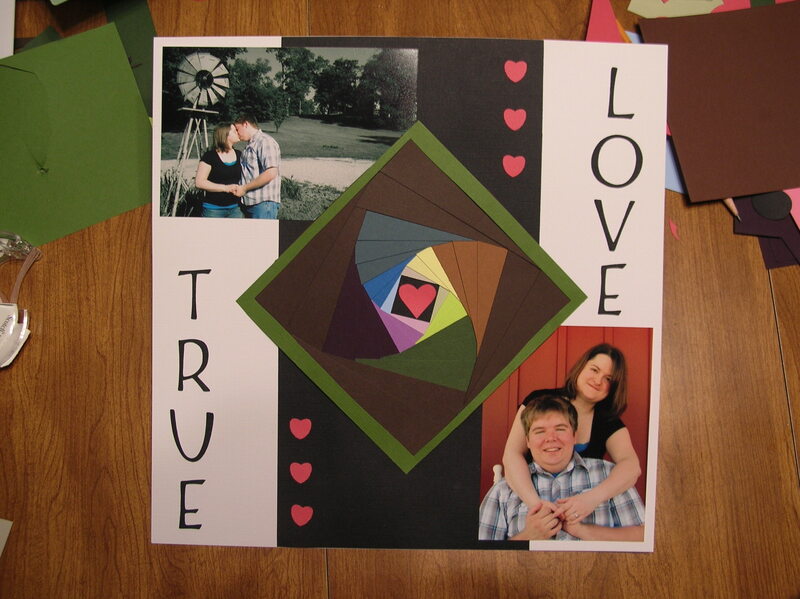 The ones I was able to make work were the small circle, the small heart, and the small flower. I have the large circle as well, but the stitching came out on that one not too long after I made it. I’m still learning to make the knot stay (it’s trickier than it seems, don’t judge!). I don’t have a specific project in mind to work on with the yo-yos, but they’re so fun to make, I really want to come up with one! 🙂 The large heart and large butterfly are on my to-buy list, once I figure out what I’m going to do with them. I’ve also learned they have a butterfly shaped one now, but I don’t know if I can wait for a project to buy one of those. The pictures of the butterflies look really cute and fun! In the last couple weeks (or three, if you’re really counting) I’ve had some opportunities to make some cards. Not only did I have the opportunity, I took it, too. So, in order of appearance, a Father’s Day card, a birthday card, and another birthday card. The first two were done with the George and Basic Shapes cartridge and the second used that one as well as the Home Decor cartridge. I am loving the card making!!! The outside of the Father’s Day card. This is the inside of Father’s Day card. I love the music paper.